What does it Mean When a Mole is Brown, and What Can I do About it? Almost everyone in the world has some experience with moles, whether they are young or old. Babies can even get moles! These growths may seem odd and even ugly, but they are actually pretty normal things. Moles are made of tight clusters of melanocytes, the cells that give skin color. Sunlight often triggers their growth, although they sometimes form in places totally absent from any sun exposure. As you get older, you’ll find more and more moles on your body, and not just in one size or color. In fact, moles can be large, tiny, or medium-sized. As for color, the most common one you’ll encounter is the brown mole. What if It Changes Color From Brown to Red? A brown mole is fairly easy to identify because – you guessed it – it’s brown. It is also called the “common mole” and can be raised or flat, and vary in size. Sunlight exposure is a common reason for a mole to start growing, but other things can trigger it, like hormonal changes. You’ll usually find a brown mole in places where you get the most sunlight, like your arms, face, chest, back, and legs. There are other areas a brown mole can grow that may seem unnerving. Under the breast: Sometimes, a brown mole may form underneath a woman’s breast. This may seem odd, since sunlight doesn’t usually reach there, but it’s actually not too uncommon. There is also something called Seborrheic Keratosis that can occur under the breast. It looks like a brown mole, but is actually a type of wart and is harmless. Unlike a mole, they have a very bumpy, shiny, wart-like surface. Brown moles are the most common mole on the body. Penile shaft: Brown moles on the penile shaft are more common than you might think. They usually occur in skin folds and are fairly small, though sometimes they are larger. Make sure you don’t mistake a genital wart for a brown mole, as the two are very different things with different causes and repercussions. In your mouth: Moles do not normally form inside your mouth, as the tissue is different than the epidermis of your regular skin. If you see a brown or black spot inside your mouth, see a medical professional for advice. On your face: Your face is a common place for brown moles. These spots can occur anywhere from your chin, to your eyelids, to your nose. They may be raised or flat. The biggest thing to worry about when it comes to moles is changes. If you’re experiencing mole changes, go here to find out more about what to do next. Moles that rise up above normal skin level are usually nothing to worry about. The fact that one mole is raised while another one is flat only has to do with the way the grouped melanocytes are growing into the skin’s layers. However, if you have a mole that has always been flat, then suddenly gets raised, you may want to consult a doctor, as this can be a sign of skin cancer. Why is it that moles come in such different shapes and sizes? When it comes to a raised mole, there are only a few differences between it and its flat cousin. Go here for more details on a raised mole. Usually, a brown mole will stay that color for your entire life. But sometimes, moles change. The skin’s normal aging process. If you notice your brown mole is changing, developing a red ring around it, for example, keep an eye on what happens. This could be due to the fact that as we age, skin is continually changing in a normal way. Or, it could be something more serious, like skin cancer. If you see any mole changes, like black spots, a ring of any color, or your brown mole turning to black, consult a physician. Even though it may be alarming, a brown or red mole isn’t always cancerous. However, if you’ve got a normal brown mole and it starts to change to red, you might want to watch more closely. Make sure that you never try to remove a mole yourself. Cutting into your body might not only give you an infection, it will cause unnecessary pain. Plus, if your mole really is cancerous, a trained professional is essential to make sure all cancer cells get taken out. One explanation for this is that you could be scratching or rubbing the area frequently, which causes enough irritation to redden it. Another reason it can happen is the normal aging process. 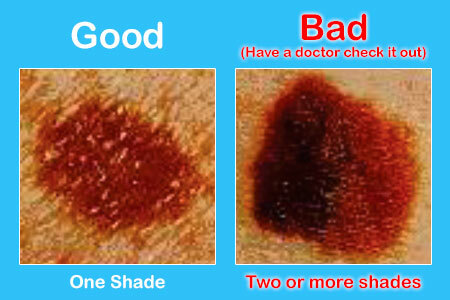 But because skin cancer also causes mole color changes, you’ll want to get it checked out. Another explanation is that your red mole is actually a Cherry Angioma, or a harmless collection of blood vessels grouped together into one small mass. While brown moles are common, red moles are usually another type of skin issue altogether. To learn more about a red mole, click here. Skin cancer can sometimes be hard to spot. Be sure to go over your body and identify your moles so that you can watch them for changes. Border: A very irregular border can be a sign of a cancerous spot. Ideally, a mole should be circular. If your mole is very different on one side than the other, this can also be an irregularity to watch out for. Color: Look for big changes in color. Size: If a mole is bigger than a pencil eraser, or suddenly gets much larger, consult a doctor just to be safe. 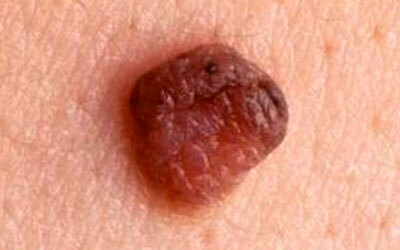 Many times, what we think is a cancerous mole is actually just benign. But because skin cancer can sometimes be hard to notice and catch, it’s always better to get your moles regularly checked. Better safe than sorry! Skin cancer, when found early, is almost always curable. Nobody likes a spot on their face, even if it’s a harmless mole. But why do they form there in the first place? For more information about moles on face, go here. Surgical: This method involves cutting, most often with a razor instrument that cuts the mole off horizontally. It may have to dig into the skin a bit to get every layer. For smaller moles, a punching instrument may be used. For cancerous moles, a scalpel may be the instrument of choice, making a larger cut to ensure all traces of cancer are gone, which will require stitches. Further details can be found here. Laser: A special instrument uses a laser to burn the mole off. It is fast and leaves little scarring behind. For more information click here. Freezing: Brown moles that are not deep into the layers of your skin can be frozen off using liquid nitrogen. This freezing agent is so cold that it damages tissue cells on contact, killing the mole. It won’t come off right away, as you’ll have to wait for the tissue to completely die and start healing before the mole will fall off. Read more here. You don’t always need a mole taken out, but sometimes, it’s necessary. More details on how to remove moles can be found here. Moles aren’t the end of the world, but they are definitely something to pay attention to. If you’ve got brown moles on your body, make sure to watch them. If anything changes or just doesn’t look quite right, don’t hesitate to call up a doctor.